Gaillardia is a genus of flowering plants in the sunflower family part of Compositae or Asteraceae like the daisy. Gaillardia are native to North and South America. I hope they grow well in Yorkshire as I have just created a new bed from birthday presents brought up from sunnier and warmer Oxford. As a perennial Gaillardia have a long flowering season are commonly called blanket flower, or if confused with Rudbeckia they can be called cone flower. The daisy-like flowers are produced from early summer to early autumn in shades of orange, red and yellow, add sizzle to the garden and attracting nectar-seeking insects. 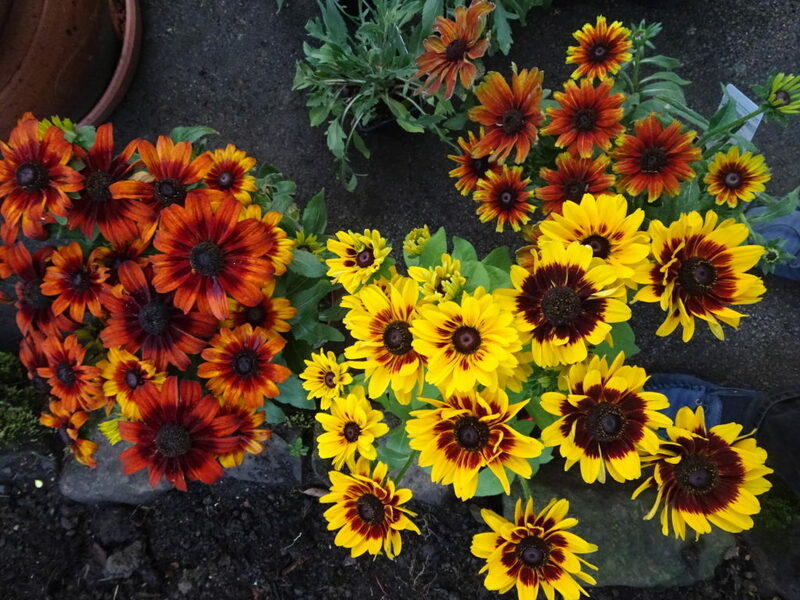 Gaillardia do not require deadheading but the plants will look better and be fuller if you do cut the stems back when the flowers start to fade. Gaillardia is easy to grow but can be a short-lived perennial so divide plants every 2-3 years and encourage reseeding. Grow best in full sun. Gaillarida forms a slowly spreading mound. Gaillarida has lance-shaped gray-green leaves. Part of the 1,620 Asteracea genera and 23,600 species of herbaceous plants. The 12 species of Gaillardia hybridise so we see a range of colours and forms. Sow fresh seed six to eight weeks before the last frost in your area. Sow three seeds in the center of the pot. Do not cover the seeds. Mist over the top of the seeds. Try provide a temperature of 60 to 65 degrees Fahrenheit and eight hours of light per day. To avoid washing the seeds from the pot’s center or burying them under the soil apply water slowly when the soil becomes dry. After germination remove the weakest seedlings and avoid disturbing the roots of the strongest seedling. Fertilize the seedling every fortnight with a 10-10-10 nitrogen, phosphorous, potassium water-soluble fertilizer. Gaillardia ‘Arizona Sun’: popular 3-4″ flowers have a red center surrounded by yellow. And Arizona Apricot. 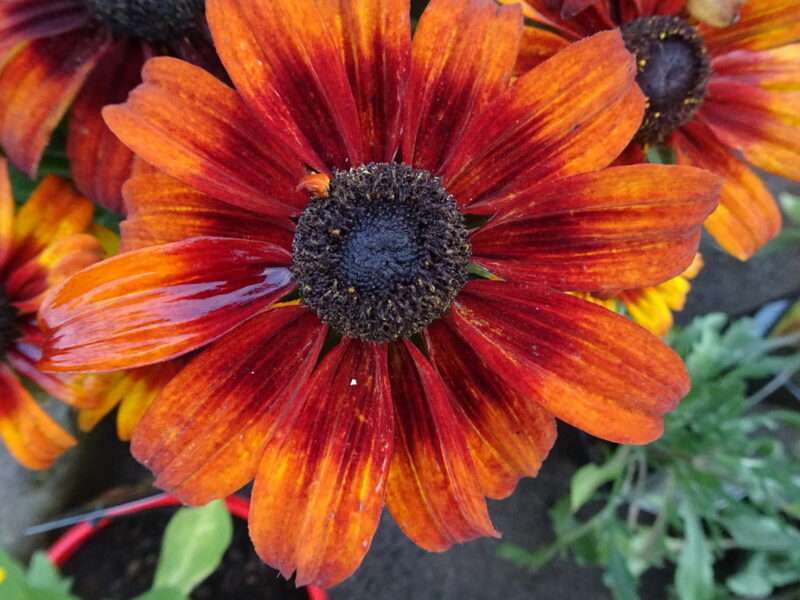 Gaillardia ‘Burgundy’: Wine-red petals with a yellow center disk that ages to burgundy. Gaillardia ‘Summerina Orange’: Zingy orange shades from soft red through yellow radiating from a rosy center disk.And Sunseekers Orange. Gaillardia ‘Goblin’: Large green leaves are veined in maroon. Very hardy. Gaillardia ‘Smileys Giggling’ YellowStriking yellow flowers grow true from seed. 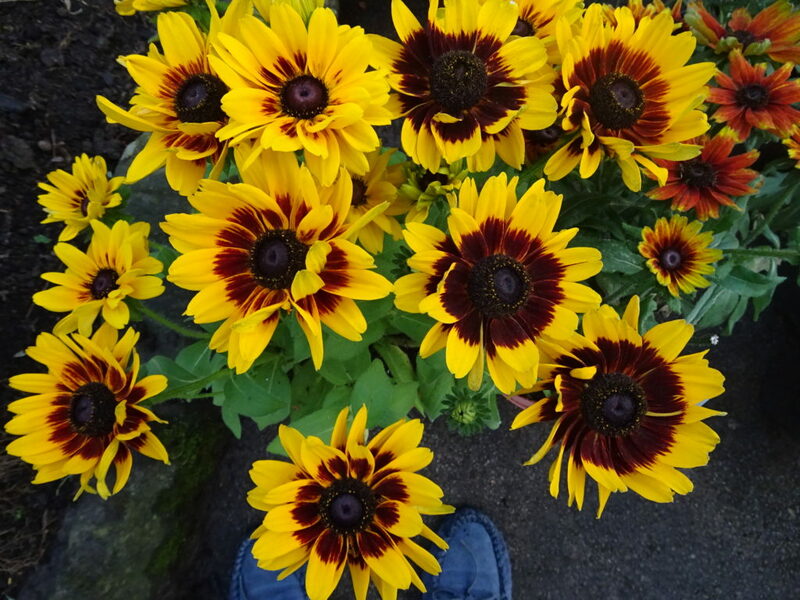 Gaillardia with slippers. It goes to show that a cool blue will tone well in the garden with the bright Gaillardia colours.